Have: A1 retro pistol parts. "LM" forge upper receiver with minimal handling marks, A2 rear sight, rapidx windage drum, aftermarket tear drop forward assist, nice A2 port door, nice anodized aluminum black delta ring, unknown 6 hold carbine hand guards, carbine length gas system, 1 in 12 twist 10 inch barrel .620 under FSB marked "SS" under HGs, forged FSB that looks like it came off another barrel and isn't the best looking on the left hand side. Exposed part of barrel and buffer tube were painted green, most of the green came off the buffer tube with stripper but I quit and painted it black. Paint on the FSB comes off with repeated application of stripper but I have lost interest, parkerizing underneath is very nice. Gold tint on the FSB is residue from a brass brush. Buffer tube is an old Uncle Mike's part that I believe is form the late 80s, end plate is modern. I would like to trade this for a retro upper / modern pencil barrel 14.5 inches or longer / something that will work on a retro or Air Force frankencarbine. Have: Partial Colt M16A1 / 603 kit. I also have a very nice flash hider like the one in the pictures of the "CMPC" barrel. 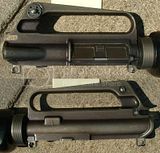 NOTE: Upper receiver, slip ring, and charging handle are original gray finish. They look a little dark in this picture and people have asked me if they are black / refinished etc. Have: "CH" forge code Colt upper receiver with "C MP CHROME BORE" barrel. 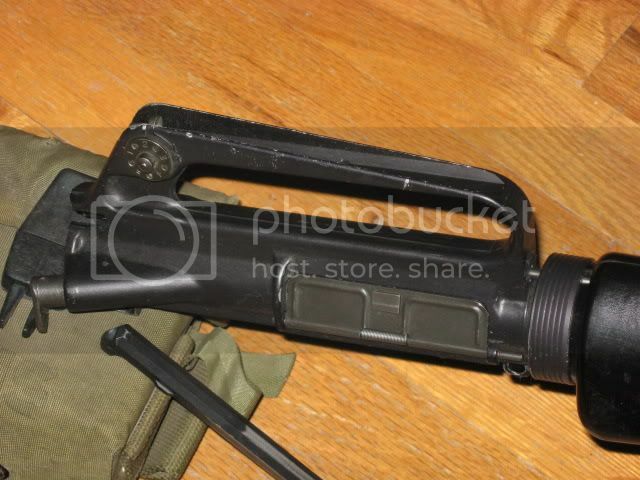 Barrel is not as nice as the rest of the parts on this upper, there is a gouge on the back ramp of the FSB and the park is worn off the edges of the hand guard cap. Gauges well, see additional pictures. Field gauge will not close with any bolt I have. Want: Unusual GM / H&R parts. Below are some examples, more pictures / descriptions can be found on this thread. Want: GM / H&R barrel, marked "MP" between the FSB legs and "C" near the flash hider, the "C" will be inline with the "MP." Some have the letters upside down on the left side of the barrel. Most of these barrels will have forging flash, a circular mark on the bayo lug, some number on the right side, and possibly some numbers / letters on the left side. Want: GM / H&R upper receiver. These have forging flash on the rear of the carry handle, some have flash on the front too. They come in various colors, this one is very dark gray / black in color. Want: Purple parts, same as above. Oh, IM works better for me. Email sent with offer for the slip rings. Bump, Offering trade of CMPC barrel for Colt aluminum carbine stock assembly. Curious if have a Colt barrel you'd be willing to sell?? I just thought I'd ask - worth a shot. Bump, got some cool slip rings in trade. IM & Email sent with RETRO Colt Aluminum stock.